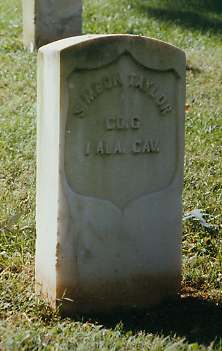 Simeon Taylor was born about 1841 in Morgan Co., AL and was a brother to Warren Taylor. They were sons of Isaac Rylie Taylor, born March 12, 1817 and Louisa Stovall, born about 1817. Isaac was the son of Robert Taylor, born about 1794 and Mary White, born November 8, 1794. Mary was the daughter of Armajer and Absellah White.